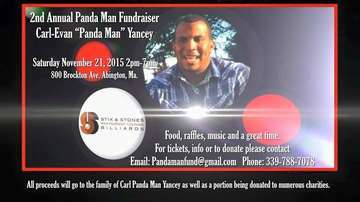 Carl "Panda Man" Yancey, of Brockton, MA died tragically on Sunday, September 28, 2014, from injuries sustained in a hit and run accident. Carl was 31 years old and would have celebrated his 32nd Birthday on Thursday, October 2, 2014. Come join us to celebrate his life with music, raffles, and more! Tickets will be available starting Friday October 23, 2015. The price is $20.00 in advance and $25.00 at the door. All proceeds will be going to the Yancey family and various charities. Carl was a great man, and would have supported the family of each and every one of you and at some point may have. Let's return the favor.